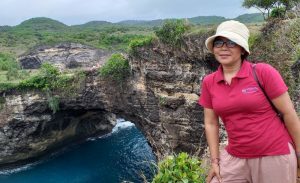 Mrs. Nyoman Kantun – Or you can call her Kantun, is one of our front line members in Asialink Indonesia Holidays. She has joined us since 21 years ago. Since she graduated from her Academy of Banking & Economy in Bandung, she worked in tourism industry in 1989. She has a lot of experience in hotelier, reservation, operation, product development, and contracting stuffs. At the moment she is our Reservation & Operation Department Head. She loves working in tourism as it gives her chances to meet many people from different countries, cultures, and characters. During work in tourism industry, she saw the incredible blend of different characters, backgrounds, experiences, form into a strong teamwork at office. And it made a better service and improvement in the tourism growth. The teamwork makes us stronger, she said. She hopes our tourism will grow and develop more of our culture and local wisdom , supported by safe-convenient-healthy tourism technologies.